It’s been a couple of weeks since you’ve heard from me so I wanted to let you know that I haven’t forgotten about you. My short break from my weekly posts was due to a combination of my workload increasing and a family vacation to Victoria, British Columbia. June was definitely a crazy month. 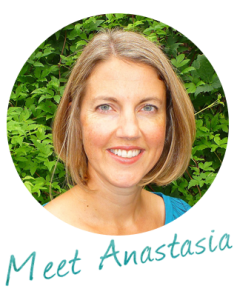 I’m happy to be back because I have lots of fun and inspiring resources and recipes to share with you this summer. 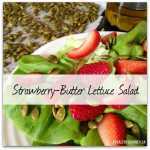 Speaking of recipes, today I have a Strawberry – Butter Lettuce Salad recipe to share with you. It’s perfect to take to a potluck or pair with some grilled chicken or seafood for a week night dinner. When the temperature soars, it can be tempting to throw the family meal plan out the window. It’s too hot to cook, right? It may be too hot to turn on your oven but you can still create simple summer meals to nourish yourself and your family. Consider tweaking your regular meal plan to make it more summer-friendly. Think salads, dips, finger foods, grilled veggies and meat. Don’t forget about fruit pops and no-bake treats to keep everyone cool without overloading on sugar. If you are tired of struggling with meal planning I invite you to check out The Dinner Time Solution. I’m all about easy and healthy meal solutions for busy families. Summer is the perfect time to take advantage of all the amazing produce and get organized before the fall hits. Toss the lettuce, strawberries, cucumbers and pumpkin seeds together in a large salad bowl. Place all the dressing in a glass jar and shake. Pour the dressing over the salad and enjoy!